OMG, find me one of these and I’ll buy you lunch with a curling lesson to follow in which I’ll teach you how to curl. You can order the set right from the mint, or get them at any participating Petro Canada or Royal Bank outlets. Check and Mate. Tonight is costing you big bucks! Lunch, curling lessons AND a coffee! Sorry bud…she didnt say show her where she could get one…she said find her one…as in get it to her. Looks like the race is on! Yesss, Mark you are right. 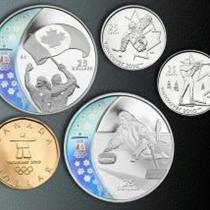 I did say – find me one of these curling coins. Ordering a coin on-line takes the fun out of my request. Hurry Hard folks, I need a curling coin STAT! KK, I’m off to the curling rink now to play my third game of the weekend. LOL’s.